In case you haven’t noticed, it’s sort of “Mother’s Day gift ideas from the spa week” here on Pretty Opinionated. I’m not sure I planned that, it just kind of happened. I do LOVE spa products! Today’s treat for mom comes from Key West Aloe, and trust me when I say it’s a total treat! 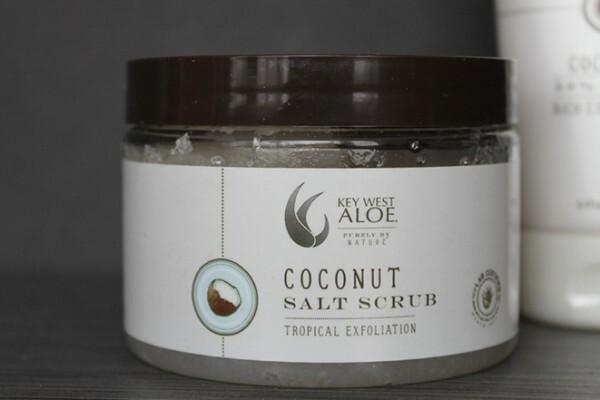 I received Key West Aloe Coconut Salt Scrub and Moisturizing Lotion for review. I love the smell of coconut, especially now that we’re heading into warmer months. Nothing says “relaxing day at the beach” better than that delicious aroma. Mind you, I’m not even a beach person. I like the idea and scent of the ocean and tropics. My Irish skin, however, doesn’t do so well in the sun’s rays. Whether you’re a beach lover or just love the idea of it like I do, Key West Aloe Coconut Salt Scrub and the Moisturizing Lotion will make you feel like you’ve landed in the tropics. It is the most coconutty (that’s a word now, because I said so) beauty product I’ve ever used. The moment you open the jar or pop the lid on the lotion you’ll be whisked away to paradise. We haven’t even gotten to how it FEELS yet! Let’s start with the Coconut Salt Scrub, because that’s my favorite. I’ve actually never used a salt scrub.Bath salts, yes, but never an actual salt scrub. I was a little scared of the salt because I’m a nail biter. A BAD nail biter. Like finger-chewing nail biter. Embarrassing, but true. I thought for sure it would sting, but the scent was so enticing that I had to try it. Surprisingly, even with all my raggedy cuticles, it didn’t sting at all. The oils leave your skin feeling so silky smooth. The scent, while strong in the jar, isn’t overpowering once on your skin. It’s just enough to be delightful. The Salt Scrub is made with Dead Sea Salt, which is pretty much the best of the best. It also contains aloe, sunflower oil, avocado oil, coconut oil, mango butter, Shea butter and cocoa butter. Basically all the best stuff for your skin. The Coconut Moisturizing Lotion is just straight-up bliss in a tube. With 50% aloe, it’s very soothing to my dry skin, which still hasn’t recovered from winter. It also contains vitamin E, rosemary extract and coconut extract. I don’t want to use it all because I know it’s going to be amazing come summer. It feels cooling without leaving you feeling all sticky and icky like regular aloe can. All of the aloe in Key West Aloe is lab-certified to be 100% pure. The products are completely decadent, but the prices are absolutely fair. The 6oz. Moisturizing Lotion I received retails for $12.50. The Salt Scrub is a bit pricier at $25, but you get 13 ounces and a little goes a really long way. Key West Aloe also has a huge selection of gift sets starting at as low as $15 for a tropical sampler mini and averaging about $30 for a really nice gift with full-size products. 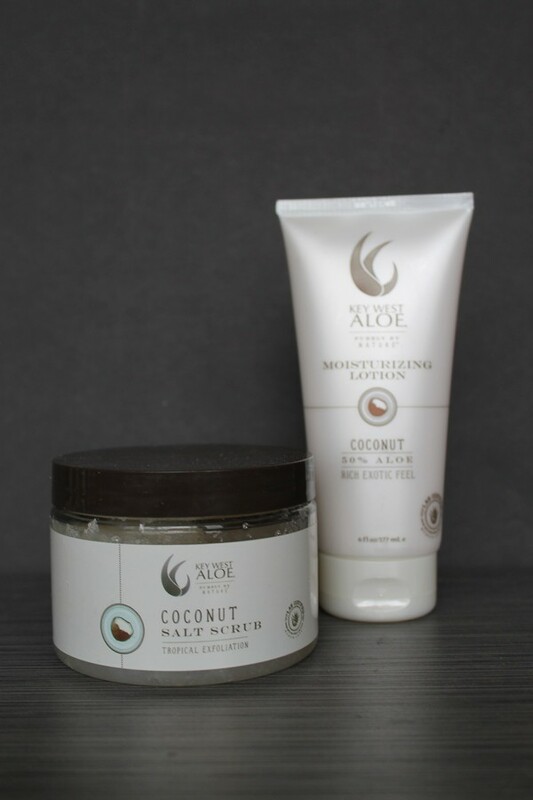 Whether you’re shopping for mom or dropping hints for yourself, Key West Aloe Coconut Salt Scrub and Moisturizing Lotion are definitely perfect for a spa theme! Head over to Key West Aloe and learn more about all their great aloe products. Follow them on Facebook and Twitter to keep up with news. This looks like a wonderful face scrub!~ I am sure it smells divine too, I would love to try this. 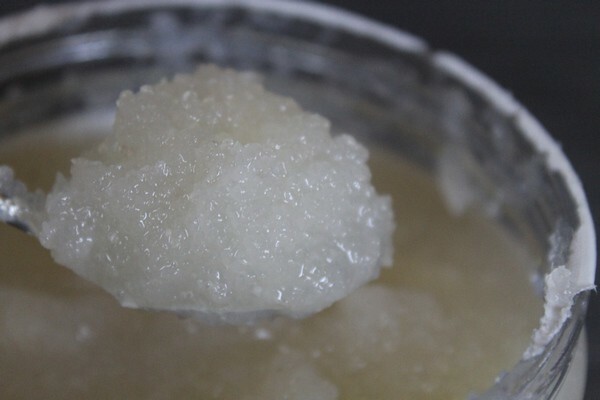 We’ve been trying various sugar scrubs lately to find something that works for us. Forgot all about salt scrubs! I LOVE using scrubs when taking a shower. I definitely would want to try this coconut salt scrub. Oh how heavenly. These would be great for Mother’s Day. I have been working out a lot lately and always need relaxation… ha! This sounds amazing!!! I love trying out new pampering products I am going to have to look for this one! I would love to get the Aloe and coconut scrub and lotion for Mother’s Day! It looks like it smells so good and would make my skin so soft! I absolutely LOVE salt scrubs!!! And anything with coconut is my favorite. It’s such a soothing scent. This would be a fantastic present for me. I love anything coconut scent and would enjoy this for sure. My skin could really use this.